Bell’s bargain priced city isn’t simply a Cinderella version of the Metropolis, rather it enjoys some unique detailing such as an integrated insect net, washable pads, Scotchlite detailing while taking advantage of the Metropolis accessory kit. Those looking for an inexpensive, second lid for winter and general hacking about town won’t be disappointed. Our "universal fit" (54-61cm) test model tips the scales at 340g, conforms to CE1078 and enjoys 16 sensibly sized vents. 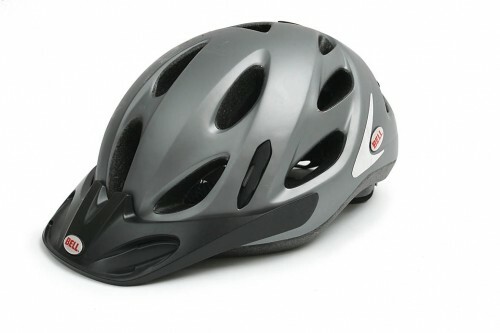 A detachable peak shields the eyes from rain, sleet and snow and strong sunlight while also offering protection against loose branches and other bridle/towpath foliage. Getting the desired fit was easy and took just over a minute straight from the box, although the straps felt coarser against the cheeks than I am used to and the rounded, conservative shape felt slightly alien compared to the angular looking performance helmet I usually wear. Even so, it stops short of frumpy. Fine tuning-even on the fly is surprisingly simple while the Scotchlite detailing and rubberised LED tab are welcome touches. Detailing, especially that of the outer shell is a little bargain basement, collecting swirls and light surface imperfections remarkably easily. However, in fairness the usual casual abuse had negligible effect upon the vulnerable, exposed polystyrene. Commuter helmets such as these aren’t comparable in weight or ventilation to race models but the sixteen vents won’t boil your brains in summer, protect against chill on cold winter jaunts and mean your head stays drier in unexpected downpours. Trench helmet shouldn’t be a problem thanks to washable pads- take it through the shower with you, should the straps and webbing start humming in the warmer months. Commuters/leisure riders seeking refinement but liking the conservative styling are better served by the Metropolis but my money’s on the citi should you want the same levels of protection while saving best helmets from the rough and tumble of utility riding. The Citi is a budget priced commuter specific helmet with surprising amounts of bang for very modest buck. 16 vents, integral insect net, peak, conforms to CE1078 and shares an optional accessory kit with Bell's more refined metropolis. Feels like you'd survive beeing shot from a cannon! 340g actual compared with 283g claimed by manufacturer. Performs better than you'd expect in most cinditions and less ventilation has been very welcome these cooler nights. Build quality is surprisingly high, although the outer shell collects marks more readily than others. Does most things very competently including moderately pacey off-road jaunts. Great value, quality where it counts. Straps could be softer against the skin.